Hokitika Scenic Tours welcomes you to the West Coast – South Island, of New Zealand. We offer a personal, safe, friendly & informative transport service to make your stay and visit here memorable. If you would like to book a Scenic Tour or create your very own Personal Tour with options of Must Do activities and Accommodation please contact us. We are only too happy to assist and cater to your travel plans. Hokitika Scenic Tours invite you to discover the local hidden treasures where time stands still in all its natural glory. Giving you the opportunity to view the magnificent scenery and attractions, that lies between the Tasman Sea and Southern Alps. Pick up and Drop off within Hokitika Area or from the Greymouth Railway Station by arrangement. Hokitika Scenic Tours transport you on a personal tour to discover the blue green waters of rock sided Hokitika Gorge. Departs daily – on request. Pick up within Hokitika area. Explore the breath-taking scenery of Dorothy Falls and tranquil Lake Kaniere surrounded by snow-capped mountains and native forest, Short bush walk optional. Tour includes Hokitika Gorge and travelling through the lush dairy farmlands of the Kokatahi / Kowhitirangi Valley. 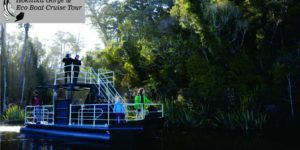 Hokitikia Scenic Tours offers a return journey from Hokitika. The journey travels along the Great Coast Road to a limestone landscape of pancake shaped rock formations. You will arrive at the famous Pancake Rocks, there you will find blowholes and surge pools. The Pancake Rocks are especially spectacular at high tide yet a stormy wild West Coast day can have the same affect as high tide due to the result of the wild Tasman Sea. Travel through lush dairy farmlands with stunning views, from the Southern Alps to the magical blue-green waters of rock sided Hokitika Gorge. Next step is to jump aboard the Eco Adventurer with West Coast Scenic Waterways and capture the picturesque beauty of Mahinapua waterways. Travel along the original route by pioneers, gold diggers and explorers. Enjoy majestic views of Mt Cook and Lake Mahinapua amongst West Coast wetlands with West Coast Scenic Waterways. 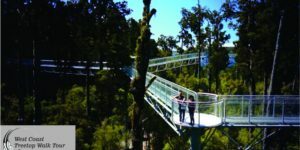 A unique and unforgettable experience – Travelling south from Hokitika through native forests with stunning views of mountains and lakes arrive at either glacier. 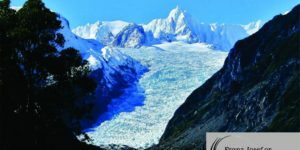 From there choose the most attractive and accessible forest walking track that suits 30 minutes return or up to 90 minutes return these walks take you to Glacier viewing platforms. Helicopter flights are available to book when you arrive. There are many options to choose from, view one Glacier or both or add a snow landing with amazing up close view of Mt Cook. All of this and return to Hokitika the same day. 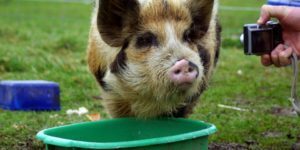 You get to meet, feed, interact and photograph the eclectic group of farm animals in all their cuteness at Blue Spur Farm. If you would like to take advantage of this personal insight to a lifestyle farm in NZ then Hokitika Scenic Tours can take you there.